Australia captain Mark Viduka has shelved plans to quit international football, saying he wants to rejoin the Socceroos for the 2007 Asian Cup. The 30-year-old striker had considered ending his Australia career to focus on playing club football at Middlesbrough. But he now hopes to rejoin the team after his wife gives birth in October. "It's a big commitment playing for Australia because there's such a lot of travelling and it means being away from the family," he told Boro's website. A lot of us were thinking when we got to those sorts of highs, is it going to get any better than this? 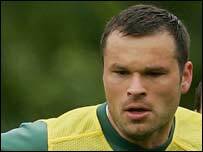 Viduka, who has scored six international goals in 32 appearances, was a key figure for the Socceroos as they reached the last 16 of the World Cup in Germany. But he considered quitting and focusing on Boro after Australia's heartbreaking loss to eventual champions Italy. "A lot of us were thinking when we got to those sorts of highs, is it going to get any better than this?," he added. Viduka said he had made a deal with Australia's caretaker coach Graham Arnold that he would miss two Asian Cup qualifiers against Kuwait to remain with his wife but hoped to rejoin the team next year. "I've come to an agreement with Graham because my wife is pregnant and we are by ourselves here, so I want to be with her at this time," he added.